The compact optical system uses free-space lasers to concentrate intensity at the flow cell. It is designed to minimize light loss and maximize resolution for multicolor applications. A number of innovations built into the optical system—including patented automated laser alignment, smart filter-mirror units for the detector arrays, and a stainless steel flow cell—are designed to maximize reliability and improve system performance. Compact heptagon detector arrays specially designed for the BD FACSVerse™ system use preassembled filter-mirror units, each with built-in memory chips that precisely identify the spectral information of both the mirror and filter. When the filter-mirror unit is inserted into the heptagon assembly, spectral information is passed from the microprocessor to the cytometer to verify that the unit matches the expected optical configuration. 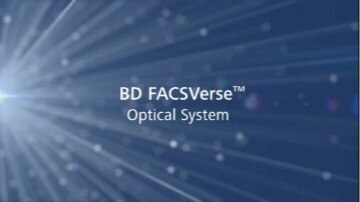 This is another way that the new BD FACSVerse system helps to ensure improved data integrity and ultimately, the reliability of results. Patented automated alignment and fine alignment features in the BD FACSVerse system also contribute to more consistent performance. Each laser can be independently aligned using a patented 30:1 optical reduction feature to make very small adjustments for achieving optimal alignment. The flow cell in the BD FACSVerse analyzer is made of stainless steel and boosts stability in two ways. First, since stainless steel is hydrophilic, its affinity for water helps reduce bubbles for better overall fluidics performance. Second, the lower coefficient of thermal expansion of the stainless steel makes the flow cell less sensitive to temperature fluctuations for more predictable, stable performance. Advances in the design of the system’s excitation optics include superior thermal regulation of the lasers. Thermal stability ensures more consistent beam pointing, and as a result, more predictable optical performance. Finally, the optical system in the BD FACSVerse flow cytometer is continuously monitored to help keep it operating at top performance by alerting users to potential maintenance issues before failures occur. The laser and operational status are tracked to help manage configuration with minimal user interaction. Fluorescence patterns of 8-peak beads are shown for FITC, PE, PerCP-Cy™5.5, and APC detected on a BD FACSVerse™ system in normal and high-sensitivity modes. Para esclarecimento de dúvidas favor entrar em contato pelo telefone 0800 771 7157 ou email mkt_bdb@bd.com.